With smooth minimalist electro pop and lush vocal harmonies, Milk and Bone has found a growing audience while charting an unusual path for French Canadian artists - singing entirely in English. The Montreal duo of Camille Poliquin and Laurence Lafond-Beaulne met studying jazz together and playing as back-up musicians when, sensing a chemistry between them four years ago, they posted on their personal social media accounts a snippet of a song that became "New York." To their surprise and delight, they quickly amassed a following. The two friends had suddenly become a band. They rushed to find management, figure out a look and choose the duo's name, the meaning of which they still struggle to explain. "We never saw it coming because at first this was just a platform for people we knew to listen to our music," Poliquin told AFP alongside Lafond-Beaulne at their hotel in Quebec City where they played the historic provincial capital's summer festival. "Pressure" - like many of Milk and Bone's songs, marked by chill but dominant percussion, melancholic keyboards and delicate, complementing layers of the two women's voices - has been streamed 9 million times on Spotify or the sharing site SoundCloud. The lyrics delve into emotional sagas, often on uncertain romances. "Pressure" likens a lover to the solace of a robust shower while "Daydream" - a track off their second album, Deception Bay, which came out earlier this year - conjures up a dreamy fantasy boyfriend. One consistency is that the songs are always in English. Both women, who are in their 20s, speak English fluently although they are French Canadians. "When I do write in French I find myself writing something outside of what happens to me, while we like to write music that is from the heart," Poliquin said. "It's a generation thing as well. People our age are a bit more open and just want to do whatever we want to do," she said. Montreal, with its complicated linguistic politics, has generated plenty of native English-language artists, from the iconic poet turned singer Leonard Cohen to indie rockers Arcade Fire. But French Canadians crossing over entirely to English is less common. Celine Dion, Quebec's best-known singer, performs in both English and French. Lafond-Beaulne - who feels that French carries a "harder" sound when sung - said Milk and Bone has not faced much backlash over singing in English. "People like to know why, and when we say it's not a conscious decision, they get it," Lafond-Beaulne said. As Milk and Bone pulls in larger audiences on the road, the duo is also planning to release collaborations with other musicians, although they said they cannot yet publicly reveal details. 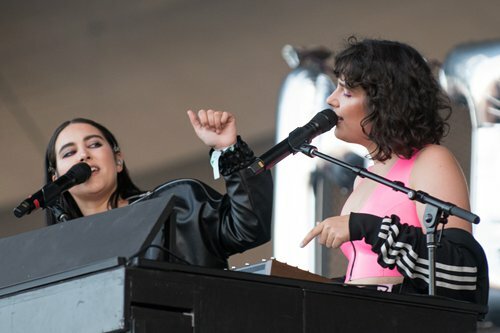 At Quebec City's summer music festival, known in French as the Festival d'ete de Quebec, Milk and Bone opened for Cyndi Lauper and Lorde on an all-women night on the vast main stage. The duo perched themselves on a podium behind their drums and synthesizers, the group's name written out in oversized balloon letters as two air dancer puppets shot out of vents. When the duo first tasted success, the pair tried to find a persona. At first they thought to associate with anime culture and released songs with subtitles not only in French but in Japanese before settling on a stage look that is somewhere between free-spirited partying and lounge chic. Poliquin said that visuals amounted to a new, and sometimes overlooked means of self-expression for musicians. "You can see right away if a major [label] is behind the aesthetic and it doesn't quite fit," she said. "It's fun to think about the visuals," Lafond-Beaulne explained. "It's like you're a teenager finding who you are. And now we're adults - young adults."